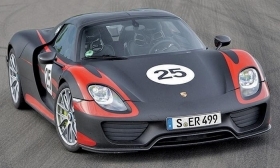 The Porsche recall includes 223 vehicles in the U.S.
FRANKFURT (Reuters) -- Porsche today launched a precautionary worldwide recall of its 918 Spyder plug-in hybrid sportscar, which can cost up to 850,000 euros ($937,000), saying a carbon fiber part could damage the cooling system and needed to be checked. Porsche, part of Volkswagen, said the affected cars were made before the end of April 2015, including 223 vehicles in the U.S., 76 in Germany and 28 in Switzerland. Owners would be contacted directly. "The cause was identified following a detailed examination of inquiries," Porsche said in a statement. "Corrective measures have subsequently been taken in manufacturing."